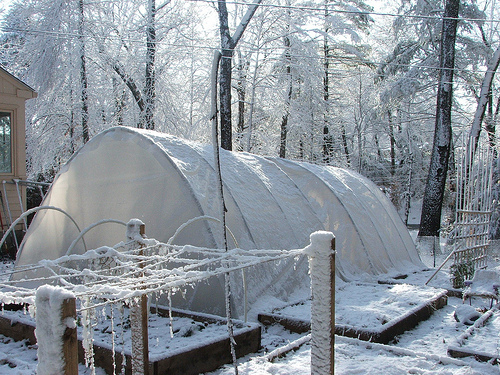 Inspired by Eliot Coleman’s Winter Harvest, we built our first hoop house in December 2009.� We got it in place right in time for the first winter storm. It was made of pvc pipes and 6 mil landscape plastic. The only “specialized” thing about it was the clamps we used to clip the plastic to the pipes. It cost $250, tops. It gave us a pretty good Winter and early Fall harvest, but it was not hassle free. It simply wasn’t strong enough. Snow load was a problem, which we addressed with a small modification (version 2.0), and lots of timely shoveling. Then the winds came, and we had a couple of close calls for a more drastic redesign. A couple of days before we planned to dismantle the by now tattered thing, it actually did blow away! 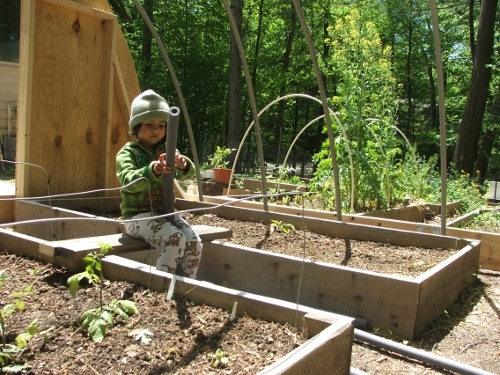 Seeing the possibilities of a hoop house in Summer (warming and protecting hot-weather crops such as tomatoes, eggplants and peppers) and in Winter (very early harvests of mache, spinach, brassicas, among others, and overwintering biennials for seed saving), we decided to put some more time and money into it. We reused almost all of the pvc pipe “ribs” and their connectors, and are reusing the plastic until a new one comes. All the new costs went into wood and metal hardware (connectors, screws, etc.). The main improvements are in the wooden baseboard and the wooden end walls. These will prevent any snow from accumulating along the bottom and stressing the pvc pipes (breaking the connectors on top, as happened before). And obviously they will prevent the whole thing from flying off again. Our new design was inspired by this one. Our improvement upon that model is that ours is movable, in that the modules of the structure are all detachable and that the plastic is clipped (not stapled) to the structure and can be easily unclasped. 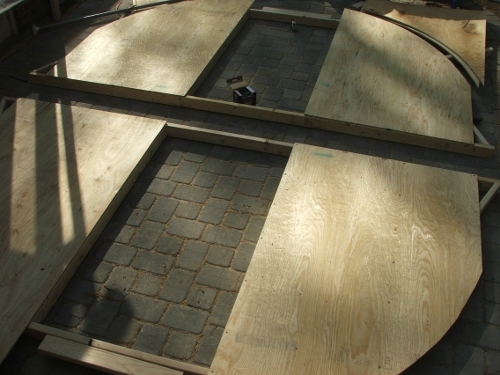 We started by making a box out of four 2x10x12 and two 2x10x8 spruce boards. 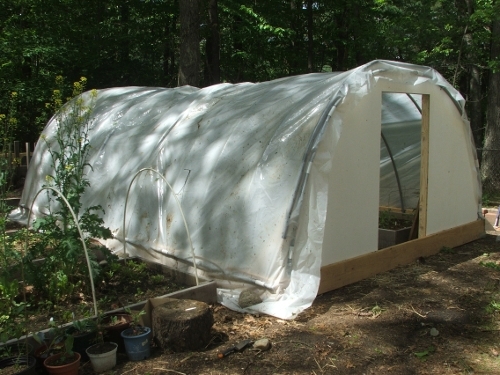 It encompasses 4 beds in each of the three positions it will take in our garden (it’s still a movable hoop house, for crop rotation). This makes it 20′ x 12′. 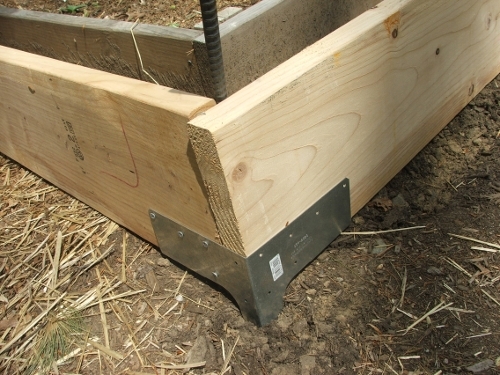 At the corners we used these Simpson rigid corner ties. All these connectors are readily available in the big box stores. We screwed these corner connectors� to the end wall baseboard (the 12 footer) only. The idea is to be able to take the whole thing apart easily, so we want to parts not to be attached. 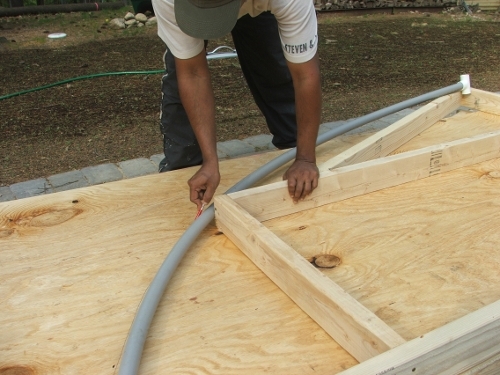 If attachment is necessary, we used bolts, for having to� unscrew screws each time we move it would ruin the threads in no time and force us to replace boards too often. 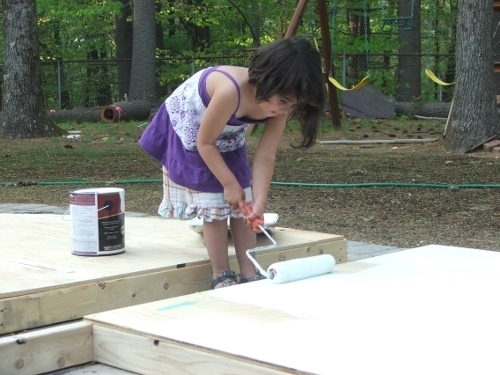 Once the paint was dry, we moved the end walls to the garden. They were heavy, but with the help of Amie’s Radio Flyer we got them into place against the inside of the baseboard box. There we braced them to the baseboard with the help of hex bolts (5″, which were a little too big). Amie had fun watching the T-nut go in as she tightened the bolt. It was a blustery day – hence Amie’s cap – but once attached these walls weren’t going anywhere! Next we fitted this foam which is used for insulating water pipes over the rough edges of the plywood, so that, when we slide the plastic over it, it won’t tear. Amie had fun prying the foam tubes open. 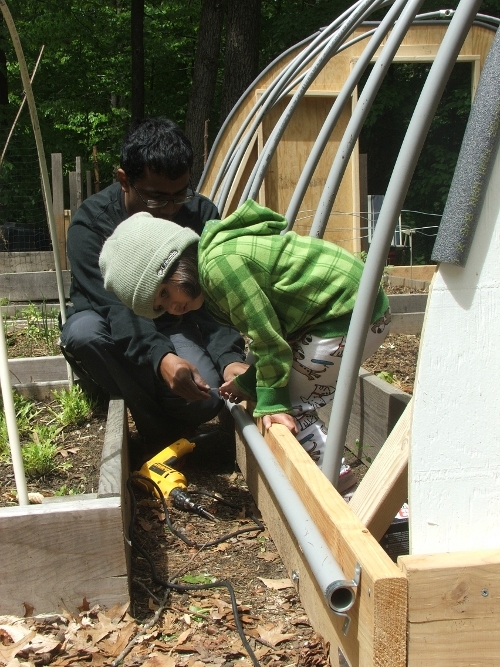 Then we placed the pvc pipes over the rebars: they’re the bendable� grey pvc, 10′ long, 1″ in diameter. We fastened these to the baseboard with galvanized pipe clips. 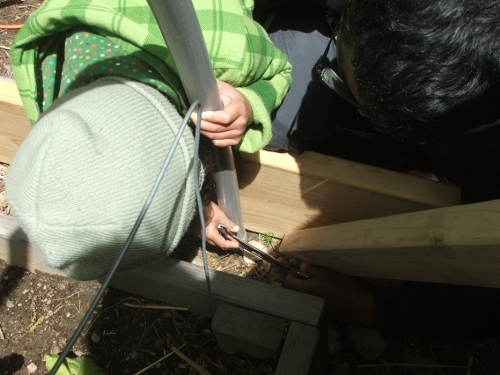 In similar fashion we bent and then attached a pvc pipe along the edge of each end wall. These pipes are to snap the plastic to, with these snap clamps which we reused from our previous hoophouse. We are reusing our old plastic, which doesn’t quite fit this version and is torn and dirty, but it will do until the greenhouse plastic arrives. Apparently, that material got cleaned out in the rebuilding of Haiti after the earthquake, so we’ll have to wait till new materials come in. The sheet will be 11 mils clear, 24ft x 24ft = 576sqft (@ $0.32 per sqft that’s $184.32), purchased at Northern Greenhouse Sales. It comes as one sheet, which will make attaching it easier and will make the whole thing look much neater. Also missing are the doors. At the other two positions in the garden the ground is not so level, so we’re worried about how well the frame of the doorway will keep its shape. 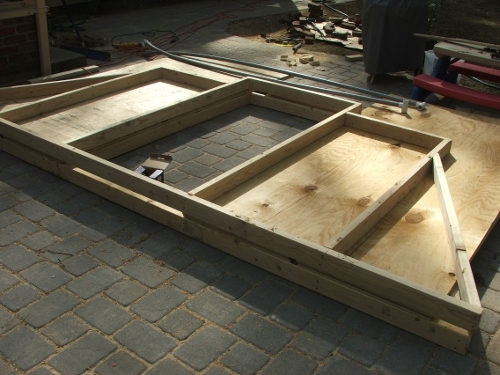 Putting in two swinging doors that fit into those frames is not a good option, so we’ll probably go with doors that slide along rails at the top and the bottom. These will be made of a wooden frame with plastic stretched over them. We’ll need doors only by the time the weather turns cold again, so we have some time to figure that one out. Another thing missing is ventilation. Even without doors, it gets pretty warm in there already. In summer we might need extra ventilation, probably with two fans, one in each end wall. We’ll cut out the holes for these once we know their size. Finally, we haven’t yet cross-connected the ribs on top. That structural element will become necessary in winter, when it snows. Until then we want to keep our options open. 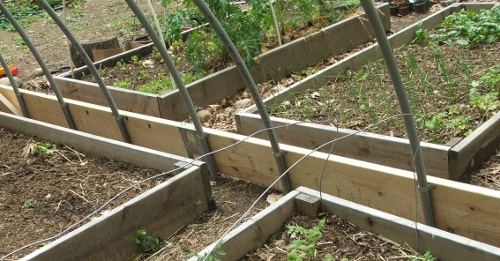 Maybe we’ll reuse the pvc pipes but run a tension line through from one end wall to another to give it extra stability. The only drawback I see, so far, is the wood. There’s a lot of wood now, and right on top of soil too. 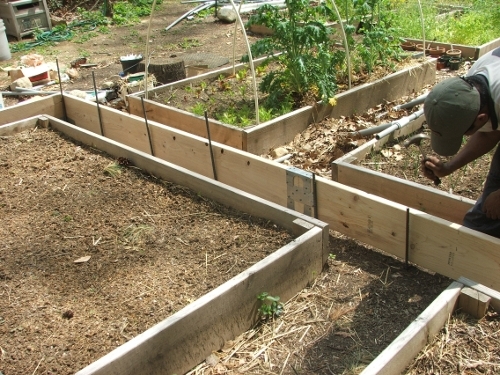 The beds, made of the same boards, have weathered their first year in the soil well. They’re darker, but I see no rot or termite damage, even not on the ones used for the potato towers. So I’m thinking they and the hoop house boards will last at least a couple of years. Five, let’s aim for five. Knock on wood! $57.48: one 20’x100′ 6 mil landscape plastic, to be replaced soon by $184.32: 11 mils Clear, 24ft x 24ft = 576sqft plastic (@ $0.32 per sqft) purchased at Northern Greenhouse Sales. Wow! Great blog! This is a really well done post – Lots of pictures, lots of details – Perfect for anyone looking to build a sturdy hoop-frame greenhouse. I hope it holds up under the snow! Mine was a little saggy last winter, so I’ll be putting in a removable center beam for the winter. thanks for the comment! You were our inspiration! I am speechless!! this is truely amazing and congratulations!!! it is so wonderful to see te whole family working together!! the veggies must be so yummy! Will get to taste them this June when I am there!! still need to book the flight! We built something similar but instead of using pvc we use poly irrigation pipe. We built it using 1″ pipe which worked OK but it was really not rigid enough so we have just bought 1 1/2″ poly pipe which will make it a lot more rigid. An advantage of the poly pipe is that it is UV protected and does not get brittle in cold weather and should last for many years. One thing we have not yet solved is the cross bracing. Various ideas but nothing yet decided (any suggestions gratefully received). 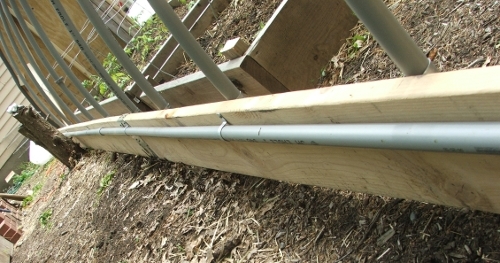 We use steel star pickets (used for fencing, do you have them in the US?) 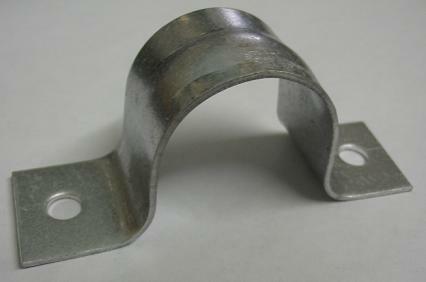 as the supports. We get over the door problem by not having one. We just use the GrowCover fabric at the ends and pull it back when we need access. It’s simple but it works fine. Admittedly, you couldn’t do this using plastic as your covering. If you are interested in seeing some pics email me and I will be happy to send you some. Great post! I really want to do this for next fall. Not sure if I’ve got a permanent spot picked out, but would like something movable at least. Interesting comments too. 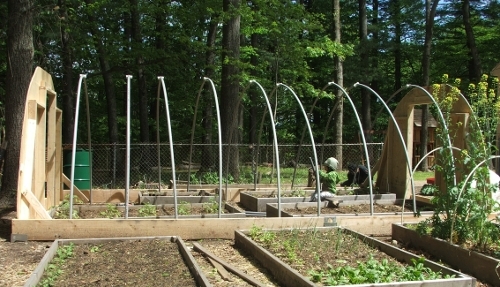 Thanks for the report on your hoop-house. I’m working on one too and was curious about using plywood on the end walls. Did you do anything to seal the edges of the plywood? 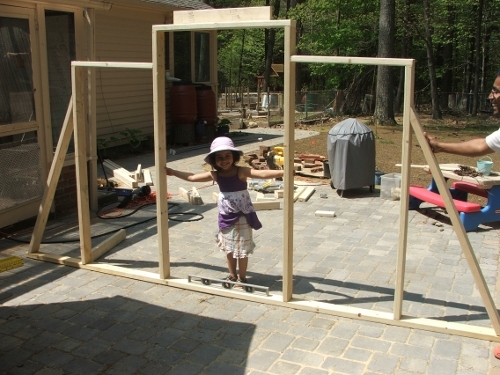 2 foot length of 2×4 will keep the 2×4 hanging on without sliding. Do you use a piece of inner tube to protect the plastic from being abraded by the clips? I am interested in your potato bins. I’m trying them for the first time this year. Do you really get substantially more potatoes? Do you always add soil or compost or do you sometimes use a mulch? I imagine a mulch would not provide as good as a medium for more tiers of potatoes to grow. 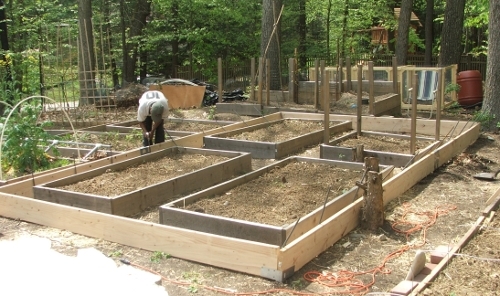 But it is challenging to come up with all that soil – I started big with 3 bins! I’ve made a bunch of those plastic clips by cutting up a schedule 80 pipe. I had to sand the edges so it has been labor-intensive, but I am hopeful they will work. How rigid are your clips? Mine snap on and off the pipes fairly easily. I was planing to use them to attach the purlins to the ribs. 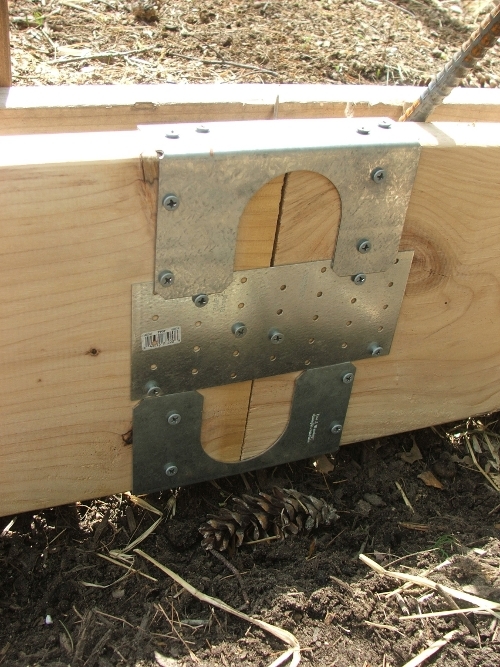 A single one screwed to a 1 1/2 foot length of 2×4 will keep the 2×4 hanging on without sliding. 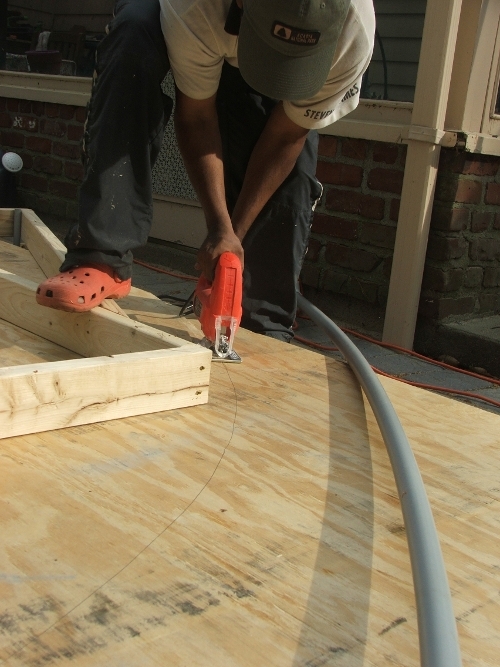 We didn’t seal the edges of the plywood since the poly is wound pretty tightly over and around them. We purchased the clips. it’s only in very cold weather, when (I think) the plastic becomes more rigid, that they are a bit hard to remove (or perhaps it’s the gloves). We’re in New England by the way, a bit west of Boston. We also thought of making our own clips but foresaw the issue with the sharp edges. 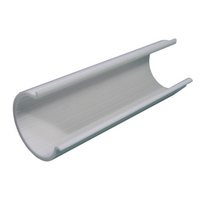 These clips have a little lip at the edges, so no sharpness there and no need for tubing. The poly is very strong, so it can withstand the sliding of the clips – which (if all goes acc to plan) will happen only four times a year. 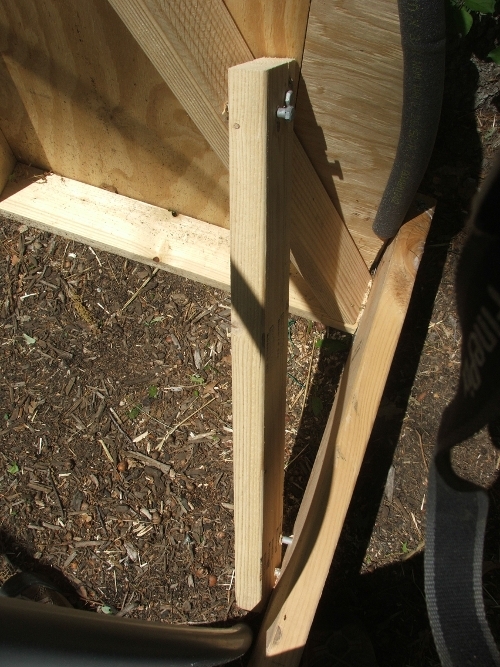 That said, I will say that if I do potato bins again, I’d make sure the compost/soil mix we used would be fluffed up with straw, and I wouldn’t add each plank as it rises so close to the previous one, leaving space for excess moisture to seep out. That said, Lesley, please don’t feel discouraged by my bad experience! I’ve heard from others that the bins *can* work! how is the 11mils clear from Northern Greenhouse Sales holding up?? how is the 11mils clear poly from Northern Greenhouse Sales holding up?? it is holding up really well. 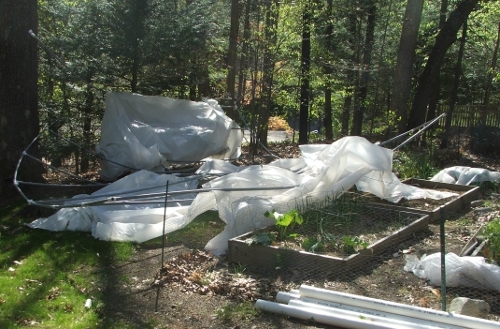 Last Fall we had two serious storms and a bough snapped off a tree above the house and crashed into the hoop house. Considering that shock and then the strain of that weight on the plastic, it did really well: no tearing where clamps were still holding it to the frame, and only one puncture hole where the bough pierced through it. I can’t say enough good things about this plastic! Great tutorial but you can get a nice metal framed greenhouse for same price. I constructed a 12 x 20 PVC greenhouse and ended up spending same price as a metal kit which lasts 10x as long.